Providence, RI (1/9/2013): Harvey Bennett Sr., the R.I. Reds’ longest-serving goaltender, was selected for induction into the American Hockey League Hall of Fame. Joining Bennett in the Class of 2013 are Jim Morrison (a R.I. Reds Heritage Society member), Ken Gernander, and Peter White. “These four individuals represent the best of the best in the storied history of the American Hockey League,” said David Andrews, AHL president. The Class of 2013 will be honored as part of the festivities in Providence, R.I., at the 2013 Dunkin’ Donuts AHL All-Star Classic. A native of Edington, Sask., Bennett made his debut with the NHL Boston Bruins in 1944-45. In 1946-47, he went 34-15-11 with a 2.68 goals against average for the Calder Cup champion Hershey Bears. 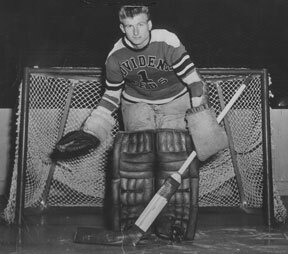 Bennett moved to Providence in 1947 and led the league in wins for three consecutive seasons, setting what was then an AHL record with 43 victories in 1948-49. That spring, Bennett guided the Reds to a Calder Cup championship. By the time he retired in 1959, Bennett had appeared in 540 regular-season games and won 260 of them, numbers that rank fourth in AHL history. Morrison, a R.I. Reds Heritage Socity member, was consistently one of the top defensemen in the AHL during a playing career that spanned 22 seasons. The Montreal native debuted in 1951-52, seeing AHL time with the Hershey Bears and Pittsburgh Hornets and NHL action in Boston and Toronto. He would spend eight years in the NHL, returning to the AHL with the Quebec Aces in 1960. Morrison was traded to the Baltimore and skated for the Clippers in 1968-69 before returning to the NHL, spending two seasons with the fl edgling Pittsburgh Penguins. Morrison returned to Baltimore in 1971. Morrison retired after the 1972-73 season at the age of 41, having played more than 700 games in both the AHL (721) and the NHL (704). He tallied 426 points and earned a record eight postseason all-star selections over his 12 AHL seasons. Harvey Bennet was the Reds' longest-serving goaltender.